Its easy to make a car go fast. Just push the pedal down as far as it will go. However, driving fast is a different story. The ability to drive fast on a track (something that is also known as “racecraft”) is not so easy. It does come naturally to some people but most of us (including me) need help! That’s where a driving school comes into play. Beyond being the coolest thing that still has the word “school” in it, driving schools are the best way to find out how much natural talent you have and build on it to get faster. There are many different driving schools out there, most notably Skip Barber and Bondurant. Audi recently opened their own school at Sonoma Raceway, Porsche is in the process of opening up their own school and track here in Long Beach, CA, and now it looks like Lamborghini is expanding their driving school program to the USA and setting up shop at Mazda Raceway Laguna Seca! Unfortunately it looks like it will only be a temporary thing as “Lamborghini Accademia” will only be at the legendary race track for a few days (September 14-17). So, there you have it. If you have ever wanted to drive a Lamborghini Huracan down the famous “corkscrew” then now is your chance! If you want to sign up it will set you back about 5 grand which is a bit of a shock but that price covers everything from the actual driving school to accommodations at a nice near by hotel, food, and more. So, really its not too bad considering the experience. Visit http://www.squadracorse.lamborghini.com for more info! There is also a few more tidbits in the press release below. Lamborghini Accademia will host its first-ever North American performance driving school – from September 14-17 – at renowned Mazda Raceway Laguna Seca. The lead role for this year’s global Accademia program is the new Lamborghini Huracán LP 610-4, which has achieved great commercial success since its debut earlier this year. The Accademia, developed by the brand’s motorsports team, Squadra Corse, provides Lamborghini clients with intense driving courses on the track, allowing them to take the first steps into the world of motorsports. It’s a captivating combination of high performance vehicles on some of the world’s legendary race tracks coupled with fine dining and hospitality. The one-day event is designed to challenge participants with morning exercises including slalom, acceleration, braking, drifting and section training at Laguna Seca’s key corners such as the famous Corkscrew. The afternoon is spent applying the learning into full-course lapping, utilizing one-on-one and video coaching. 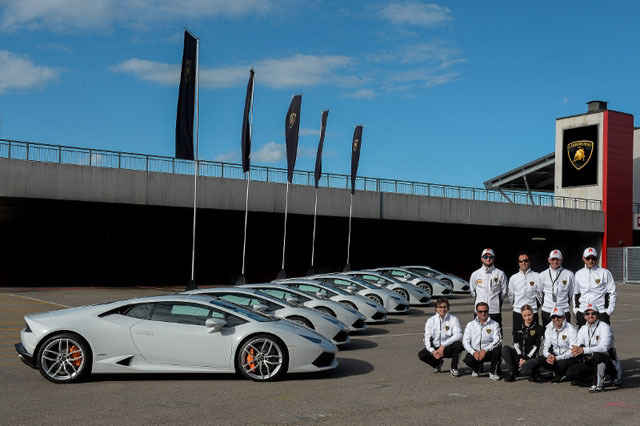 At the end of the day each of the 24 participants will receive a certificate from Lamborghini Squadra Corse stating their completion of the course. After Laguna Seca, Lamborghini Accademia goes back on the road with a stop at Hockenheim, Germany on October 1-2. Winter Accademia event dates, for the 2014-2015 season, will be announced shortly. Founded in 1963, Automobili Lamborghini is headquartered in Sant’Agata Bolognese, in Northeastern Italy. The Lamborghini Huracán LP 610-4, which made its world debut at the 2014 Geneva Motor Show is the successor to the iconic Gallardo and redefines the luxury super sports car driving experience with its innovative technology and outstanding performance. The Aventador LP 700-4, in Coupé and Roadster offerings, represents the reference point in the world of V12-powered, luxury super sports cars. With 129 dealerships worldwide, in little more than half a century Lamborghini has created an uninterrupted series of extraordinary, exclusive cars that include the 350 GT, Miura, Espada, Countach, Diablo, Murciélago, and several limited series like the Reventón, Sesto Elemento and Aventador J. The Veneno Coupé, the Egoista and the Veneno Roadster, were created to celebrate the brand’s 50th anniversary year in 2013.